Let there be light… just not too much. 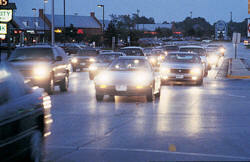 The focus of our project is to find a way to deal with glare that would affect the safe operation of a motor vehicle. We all have some experience with the glare phenomenon, be it from the headlights of an oncoming vehicle or the setting sun. It causes, at best, irritation and, at worst, an unsafe condition in which the driver cannot see the road or potential hazards in front of them. The following graphic, based on data from the US Department of Transportation, Federal Highway Administration, shows the steady growth of registered cars on our roads from 1970-2000. We believe that the dip following 1990 was a direct consequence of the Clean Air Act of 1990 which raised the federal automotive emission standards. Many accidents on our roads and highways are a direct result of glare affecting a driver's field of vision. If even a small percentage of the 11,000,000 windshields damaged yearly in the U.S. were a result of preventable accidents precipitated by glare, then we should be able to reduce the amount of non-biodegradable safety glass in our landfills. Image courtesy of Michael K.
So, what causes glare? What makes it annoying or even disabling? Generally any type of glare is due to a bright steady light source which emits light that is considerably brighter than that of the surrounding area. The two major types are discomforting glare and disabling glare. Discomforting glare causes uncomfortable sensations in the eye and commonly results in eye fatigue. Disabling glare is caused by excessive and intense light and is extremely unsafe since it makes it difficult for the eye to distinguish slight dimming and brightening of moving objects. Being that driving is, for the most part, a visual event, both kinds of glare are serious problems. For night drivers, good visibility is imperative. Our eyes work properly when there is a sufficient amount of lighting from headlights and overhead road lights. Lighting is needed to see the road, oncoming traffic, lane dividers, pedestrians, and other, potentially hazardous objects. Certain car parts have been designed to reduce glare which is often defined as horizontally polarized light that has been reflected off a nearby surface. How does the eye respond to light? Is there technology out there that has already addressed this problem? Are there cars already being designed that have eye sensors that are localizing visual properties of specific regions in the windshield? All of these questions were investigated. We found that science and industry have examined these problems in the past and created some novel solutions. Photochromic lenses, electrochomic glazing, themochromic glazing, and layered mylar films (used by NASCAR and our nation's military forces) are examples of tunable tinting that we see in use today. Each of these technologies has limitations. Some of these limitations are based on their natural properties and others are based on legal or safety standards for windshields. We have set out to design and produce a windshield that, while reducing glare, will not darken or obscure the driver’s vision below current automotive standards. To accomplish this we considered manufacturing a windshield with technology invisible to the naked eye. Throughout our research we investigated a variety of possible solutions to the problem that are all found in the nanotechnology industry. Our final areas focused on photonic crystal lattices, a film of liquid crystals, and moth-eye gratings. All three of these are produced on either a micro or nano scale. This led the team to choose Manufacturing as our National Critical Technology. We began our investigation under the assumption that we could diminish the annoyance factor of glare by blocking or reducing the wavelengths of light most commonly associated with glare from headlamps. During this part of the project we divided the team into two groups to investigate photonic crystals and liquid crystals. As we found more information, we stumbled on even more possibilities, the most promising of which was moth-eye gratings. Moth-eye gratings turned our attention from wavelengths of visible light to intensity. As one can see from the following pages, the applications of this emerging technology are extraordinary. There are a variety of industries that will be revolutionized by this, from the tech sector to the auto and insurance industries. Everyone will have an economic interest in bringing each driver’s ‘window on the world’ closer to being a precision optical device that enhances their ability to see.